When you're looking for dock leveler repair, you want it to be fixed quickly. As long as its not functioning well it may affect the productivity level of your business and will take a negative effect to your profit. You also want that kind of loading dock repair service that will make your dock levelers work efficiently for long time, delivering convenience and safety. Loading Dock Inc, has an extraordinary repair team that can replace and repair any kind of damage to loading dock equipment, Including service, replacements, parts and repairs for your Blue Giant Dock Plate Equipment. Blue Giant Dock Levelers started manufacturing dock leveler plate equipment since 1963. 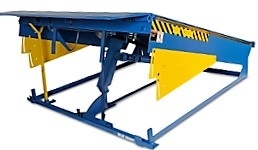 They offer dock levelers for any type of material-handling operations. Find out the list of Blue Giant Dock Plate equipment that we service by reading more below.